Home / Articles / What Do Rotten Teeth Look Like? Most people experience mild to moderate dental problems at some point in their lives, but in some cases, these oral health problems become severe. Rotten teeth can develop over time if you neglect your dental health. It’s also possible for teeth to decay and rot even if you try to practice good dental care, but your health otherwise is suffering. What should you be on the lookout for and how do you know if you have rotten teeth? In most cases, by the time your teeth are rotten, you’ll be able to tell easily. 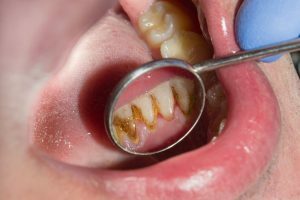 Some minor tooth decay might not be visible, but rotten teeth are blackened and appear to be decaying. There might be cracks or breaks, and the edges are likely to be rough. In addition to the teeth themselves, there’s a good chance you’ll have gum damage as well. You might notice redness or inflammation around the gum line, and there’s a really good chance your gums will be sore and bleed when brushing your teeth or flossing. In most cases, you’ll have some moderate pain with rotten teeth, too. Our mouths are filled with bacteria. In some cases, these bacteria are protective, but consuming high sugar foods and/or not brushing and flossing on a regular basis can cause the bacteria in our mouths to build up and damage our teeth. Over time, if this decay is not dealt with by a dental professional, it can lead to rotten teeth. Many people have several teeth that are damaged and rotting at the same time, but it is possible for just one tooth to rot. Another cause of rotten teeth can be beyond our control. When a person’s health is less-than-perfect, it can affect their dental health. Our immune systems not only prevent us from getting sick and developing diseases, but they also play a role in our dental health. Many dentists are able to predict a person’s oral health based on their overall health. To learn more about health problems linked to poor dental health, check out this information from the Mayo Clinic about oral health. Many of the problems with our immune system are related to our body’s ability to fight off bacteria. 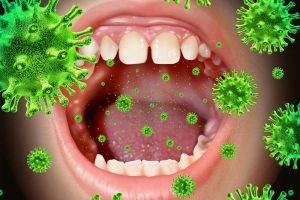 Just as a healthy person would have a better chance of fighting off a bacterial infection anywhere else in our bodies, a stronger immune system also makes it easier to fight off bacteria in our mouths. Suffering from dry mouth can also exacerbate a problem with rotting teeth. Saliva is a good thing to have in abundance,and it allows us to maintain good oral health. It flushes away acids and bacteria and prevents these things from doing too much damage. And since some diseases can cause you to have dry mouth, it can be tough to prevent a problem. If you suffer from a condition that causes you to produce less saliva than usual, it’s important to drink plenty of water and brush and floss more than recommended. Finally, and something that is totally within your control when it comes to your dental health is the consumption of sweets. The more sugar-filled foods you eat, the more likely you are to develop dental health problems. In addition to all of the usual high sugar culprits, pay attention to foods with hidden sugars. Many foods that are high in sugar are also high in acid, which makes the problem with rotten teeth even worse. People who suffer from gastrointestinal reflux disease and those who drink a light of high acid beverages tend to suffer from dental problems more than those who do not fit this description. 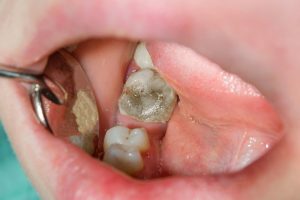 What are the Symptoms of Rotten Teeth? Determining if your teeth are rotten is usually fairly easy, as long as you’re able to see the tooth or teeth in question. Cavities tend to darken teeth,and the more severe the cavity becomes,the darker it can be. Black spots on or over the teeth are a sign of decay and rot. If you notice a tooth has become gray or black, you need to schedule a dental appointment immediately. A single black rotting tooth might not seem like a dental emergency, especially if you aren’t experiencing serious pain, but the decay can spread. Left untreated, a single rotting tooth can affect the teeth on either side,and the rot can spread even further to other teeth. It’s impossible to detect the rate of growth of the bacteria causing rotten teeth, so you need to do everything you can to prevent the problem from worsening. Another symptom of rotten teeth is bad breath. It might seem like common sense, but some people don’t realize their bad breath is actually caused by their dental health. A rotten and decaying body is bound to cause odor and teeth are no exception. To learn about various causes of bad breath, read this information from WebMD. Occasional bad breath following a pungent meal isn’t usually a sign of a problem, but ongoing problems with bad breath mean your dental health needs attention. Another way to recognize rotten teeth is by the variation in size. Rotten teeth tend to vary in size from healthy teeth. This is due in part to how the bacteria affects the size of the gums. So, in some cases, “bigger” teeth are a sign of a problem. However, this isn’t always the case it’s possible for rotten teeth to look smaller than their healthy counterparts. This is especially the case if the rotting causes your teeth to chip or break. Finally, you’ll want to take immediate action if you notice a tooth is loose. It’s possible to lose a tooth as an adult if you’re involved in some kind of trauma that knocks your tooth loose, but you can also suffer from a loose tooth if your teeth are rotting. And if a tooth falls out of your mouth, you need to get to the dentist immediately. This is an indication that your dental health is so poor teeth are dying and falling out of your mouth. To learn more about loose adult teeth, check out this information from Livestrong. The best way to deal with rotten teeth is to prevent them from rotting in the first place. And if you suspect your teeth might be on their way to rotting, you need to schedule a dental visit as soon as possible.